This month's Sealed Section is one of Mark's favourite "recipes" for creating our luminous, glorious Aussie skies. Dig in and experiment with some colour! CLICK HERE TO ACCESS YOUR FREE PAINT RECIPE CARD! Feel free to download and print so you can have it close to hand with your painting rig when inspiration next strikes! Get loose people! Grab yourselves a blank canvas and wet it thoroughly. Add your favourite acrylic colours, starting at roughly the centre with white, moving out to the edges of the canvas to darker colours. Add splatty water all over with a loaded brush and tip the canvas this way and that, watch the colours do their thang. When dry, see what your painting is trying to tell you. Is there a painting in there? Or was it just a fun exercise to excite your mind again! Mark's "Sun Over Water" workshop was loads of fun for all involved. One enthusiastic student was heard exclaiming "Hey everyone! I just arted!". Hmmm, maybe you had to be there…. Click here to read more... To sign up for our next workshop, please contact us. 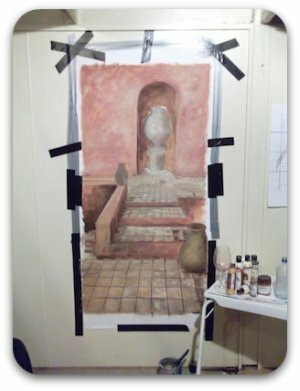 Landscape Painting Tutorial Page Now Up! Mother's Day Is Still A Little While Away! HOWEVER! Now is the time to start thinking all you good sons & daughters! We have some wonderful specials on Mark's gorgeous Angel lithographs at the moment. For the beautiful and deserving angels in your life, check out Mother , only AUD$15 + postage, for a gorgeous gift for your well deserving mother. For those of you lamenting that it's just too hard to find time to be artful in your super busy schedules, Nicky Tillyer at Artful Genius has a solution. 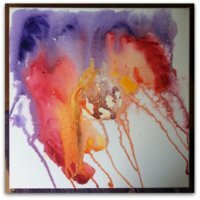 Sign up for the free 12 week Artful Appreciation of Me e-spiration e-mail course. Six fortnightly emails with some crazy, kooky, fun-lovin' and zesty idea bursts that will get you out on the streets, cutting up your mags, taking random pics and writing love letters to yourself. Tracey's vibrant, colourful and somewhat kooky approach to her art, and her great love of animals, appealed to us all here at AA. The more you look at Tracey's site, the more you love! Check it out here. Tracey has been pretty much chained to the easel in the lead up to her exhibition "Kaleidoscope", currently showing at Traffic Jam galleries at Neutral Bay, until April 19th. (And loving it!). 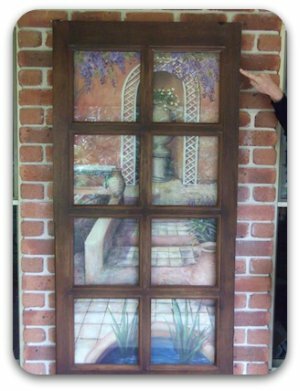 This month we feature great friend of Acrylics Anonymous and art teacher since 1990, Maria Heaton's amazing Trompe-l'oeil (French for "deceive the eye"). 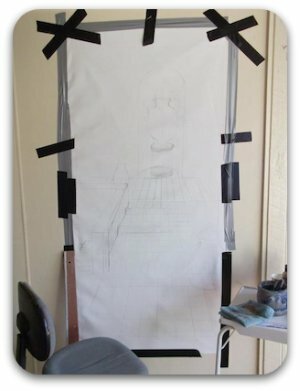 Maria wanted to create a Trompe-l'oeil piece, and then just happened to have a perfect window frame to place over it! Hope you enjoy her journey. Do't you just love seeing where a painting takes you! Thanks so much for sharing Maria. © Copyright Mark Waller and explore-acrylic-painting.com 2011.